The spiritual renewal of families was recently held in Medjugorje when whole families came and there were around 200 participants, 90 children among them. Tereza and Miroslav Ljubic from Kastel Luksic came and two of them fostered two children after being in a marriage without their own children. They spoke about their testimony of faith and relying on Jesus and the help of God in the programme of radio Medjugorje. 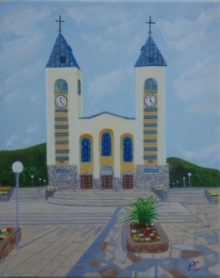 Miroslav said that he came here for the first time ten years ago: " I saw that people were coming here for one day, but I feel one cannot have experience of Medjugorje in one day only, one needs to stay here longer. You can see how people find peace here, they find prayer, when so many people are praying Rosary, miracles need to happen. Medjugorje is a place of prayer, of special relationship towards Our Lady, while the biggest grace is in confessionals." Tereza said that they as family are everyday praying Rosary: "Rosary was hard for children in the beginning as they were not in the centre of attention. Today, each of them says one decade every time we pray. We are directing them to faith, to know that only faith could help them in their lives."